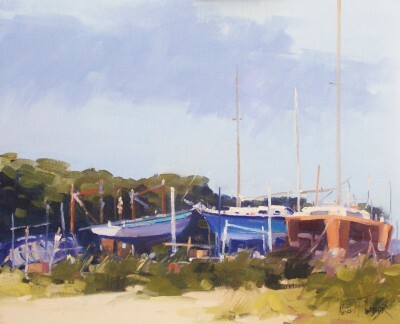 Right now we are waiting for new Helen TURNER Art to arrive at the gallery. In the meantime, here is a selection of the artist's archived art work which has featured at Red Rag Art Gallery. 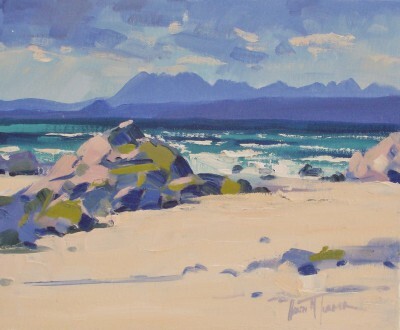 If you wish to register to receive updates and alerts when new art work from Helen TURNER arrives select this link. 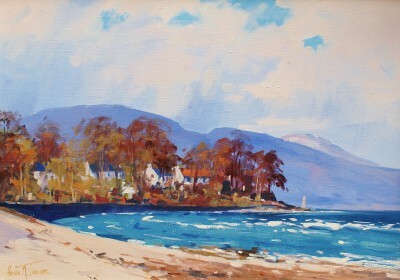 Helen M Turner was born in Scotland in 1937. After leaving school Helen worked in the creative design studios of a leading Scottish carpet manufacturer - James Templeton. She also attended the world renouned Glasgow School of Art on a part time basis. Her art tutors were Trevor Mackinson and William Gallagher with whom she further developed a natural talent for drawing and painting. Helen Turner later became a Documented Designer in Aubusson and Beauvais. She travelled widely throughout the world and produced designs for Waldorf Astoria in New York, the famous Turnberry Hotel in Scoland and the San Francisco Opera House. Helen finally made the decision to leave the design world and make a career as a full time professional artists. 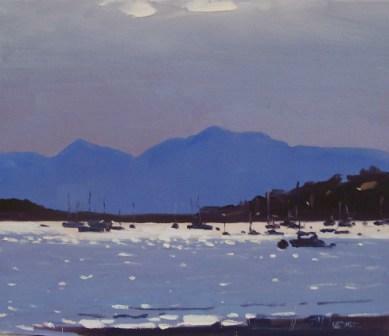 She has never looked back and is now recognised as one of the leading Scottish contemporary artists. Helen Turner paintings are typically strong, powerful art works full of confidence. 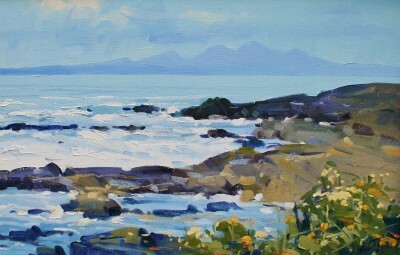 Her Scottish landscape paintings are rich both in subject matter and tone. Helen excels at recording the atmosphere and magic of the Scottish climate highlighting moments of time. 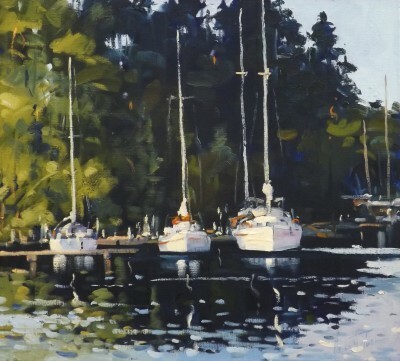 Part of the enduring appeal of Helen's paintings is the way she masters light and shade for effectively. Helen Turner is an artist blessed with real versatility. 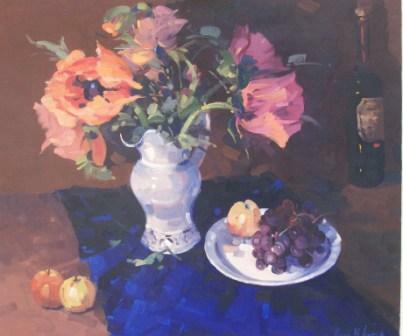 In addition to her highly successful landscape paintings Helen has also developed an enviable reputation for beautiful still life and stunning floral art pieces. Her art works are instantly recognisable and highly souht after. 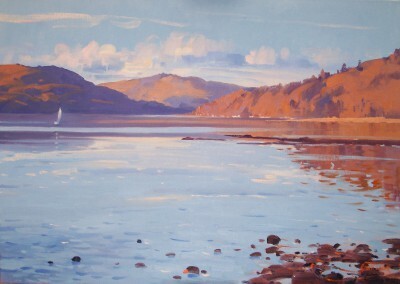 In 2000 Helen Turner was awarded The Paisley Art Institute Diploma PAI. In 2001 Helen was appointed President PPAI. 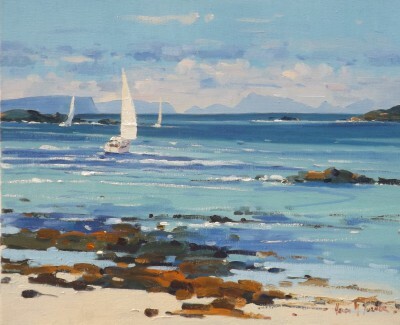 She is also a lay member of The Glasgow Institute and an Artist Member of The Glasgow Society of Women Artists GSWA.Helen's paintings are in many private art collections throughout the world and also within corporate art collections including Robert Fleming Holdings, Dunedin Fund Managers and Lloyds Banking Group. 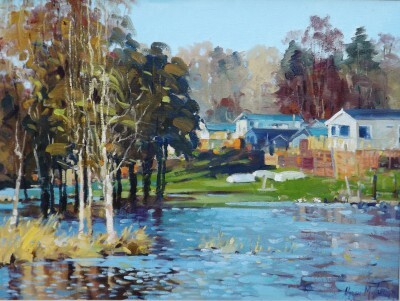 In addition to Red Rag Art Gallery Helen Turner art work has been exhibited at other leading Scottish Art Galleries and at galleriesin Russia, France and Hong Kong. Each painting at Red Rag is sourced from the Helen Turner artist studio and like all Red Rag Modern art and Contemporary art it can be shipped worldwide. Artist Helen TURNER is one of a growing number of artists whose modern art works feature at Red Rag Gallery in Bath. Modern art work from Helen TURNER is regularly exhibited at the Bath art gallery which also offers an extensive choice of modern art, contemporary sculptures and collectible art prints from other present day artists. Should you wish to buy or require further information about modern art from Helen TURNER please contact/email Red Rag Modern Art Gallery or alternatively contact Red Rag on the number below.